Say you had a family of five. Now say I handed you $11 and told you that was all the money you had for all five of you to eat for the day - breakfast, lunch, dinner, snacks, and drinks. Eleven. Dollars. Please assume that three members of that family of five were children and/or teenagers. Imagine that they need fuel to get their bodies and brains working in the morning. They need a balanced, nutritious lunch to replenish all the energy they spent learning that morning. Of course there's an after-school snack...preferably one that is not pure junk. Not only is there dinner to think of, but possibly even dinner for your teenage athlete who after waking up extra early and getting in a practice before school even began, also needs a bit of an extra-large dinner when they collapse inside the front door late in the evening. Could you feed your family on $11 a day, every day? Don't forget that some days you just need dessert. Or a birthday cake. Or those special occasions when a steak-more-expensive-than-a-two-day-allotment is called for. More than likely you wind up eating a slow-cooked roast, instead (not that there's anything wrong with a slow-cooked roast...but a rare, juicy steak it is not). The average benefit for the recipients of food stamps or the supplemental nutrition assistance program is $3-$4 per day, per person. But it doesn't have to be that large. The family of five that I mentioned? Their benefit works out to $11 per day, which is $2.80 per person a day. I know of people who spend more than that on just their morning coffee. This household has one parent who works full-time and one who works part-time. One parent is a college graduate. They both work hard, but after paying all of their bills and living expenses - without flourishes - they barely scrape by. Hunger and proper childhood nutrition is an "issue" all over America. Fortunately, food insecurity can be curbed with a bit of education and assistance. Planting and tending to a vegetable garden is one way that many can gain a source of nutritional food at a low cost - at least for a good amount of the year in cooler climates. Cutting coupons and menu planning is another way to budget meals and money well. Buying in bulk (because that $11 a day is not given one day at a time) and freezing/storing items properly can definitely stretch a dollar. Adding whole grains and fiber-rich foods is a good way to satisfy any belly. Eating a rainbow of veggies and lean proteins...keeping an eye out for sales, discounts, and specials at the grocery story...and most importantly (in my opinion) is educating those who don't know about the importance of eating as many whole foods as possible and leaving those pre-packaged options on the shelves. I know that there is so much more to it than this. I know more than one family who receives food assistance in some form or another - it's not an isolated problem. And though it may seem like much in the big picture, it's little things like a collection of wholesome, inexpensive recipes like this that can start to make a difference. If only to one family. This soup cost ~$2.50 per serving, but it is packed with protein, whole grain noodles, and vegetables. Heat oil in a small saute pan over medium heat. When hot, add garlic, ginger, and chile flakes; saute for 1 minute, stirring constantly. Add mushrooms and continue to saute until they are tender and starting to turn golden in spots. Set aside. 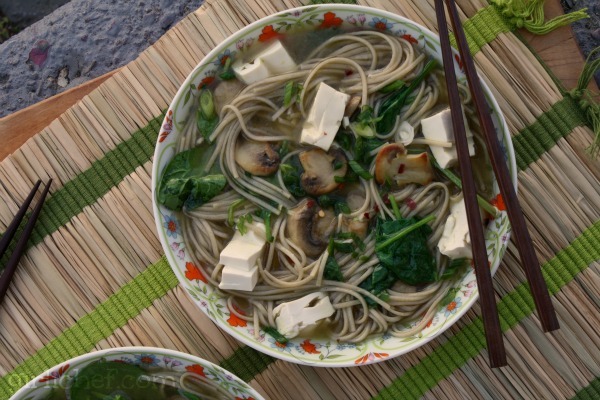 Bring chicken stock to a boil, and then add the soba noodles, soy sauce, sugar, and reserved mushroom mixture; simmer for 4 minutes. Remove from heat. 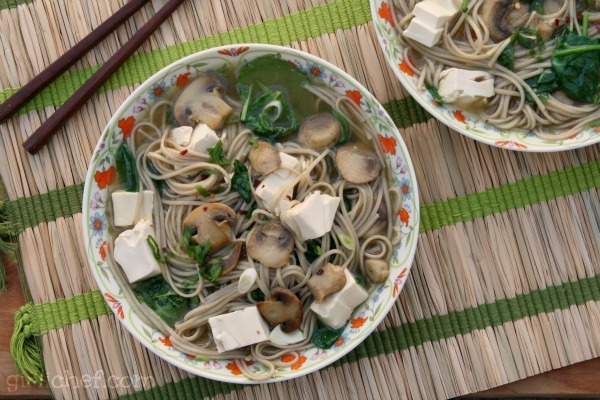 Put one handful of the baby spinach in the bottom of each of the bowls and divide the tofu evenly over the spinach. Carefully lift half of the noodles out of the pot and place in one of the bowls, and then do the same with the other half. 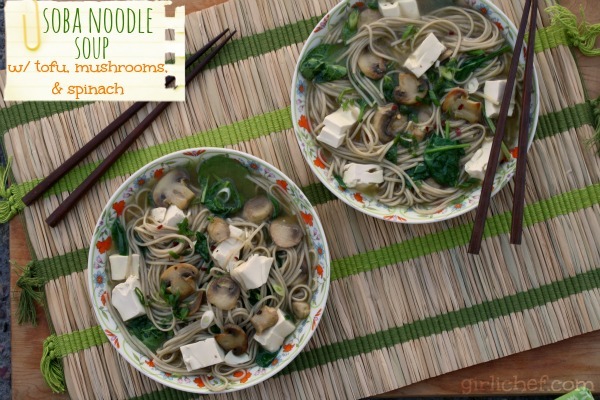 Divide the hot broth and mushrooms evenly amongst the bowls and let sit for 1 minute before stirring everything around. Sprinkle with the scallion and eat right away! Join the call to action by sending letters to your representatives in Congress. Let's flood those inboxes with letters today! Tweet Congress to end hunger. Carve out some time to watch A Place At The Table. Find a screening in your hometown, on Amazon, or iTunes. Visit the coordinator of this Food Bloggers Against Hunger event, The Giving Table for more resources and links to other posts.